This release will be of considerable interest to Elgar collectors. In the first place it contains the earliest recording, so far as I know, of the Cello Concerto by Jacqueline Du Pré. This performance with Sargent was her debut at the Proms. She was just 17 at the time and she’d made her full orchestral debut – also with the Elgar concerto – only the previous March in a concert at the Royal Festival Hall. The present performance comes well before her celebrated 1965 studio recording with Barbirolli (review). This performance is not to be confused with another live Du Pré/Sargent recording, issued by BBC Legends. That account of the work, which I have not heard, dates from 1964 (review). The 1961 broadcast of The Dream of Gerontius is also significant. Sargent made two commercial recordings of the work, both of which I discussed in my survey of recordings of the work for MusicWeb International. Both involved the Huddersfield Choral Society and the Royal Liverpool Philharmonic Orchestra and were made in Huddersfield Town Hall. The first was set down in 1945 and featured the incomparable Heddle Nash as Gerontius. Then, in November 1954 Sargent made a new recording which was to be issued to mark his sixtieth birthday in 1955. The three soloists that took part in that 1954 recording, made under studio conditions returned to do the honours for him in this 1961 concert. Incidentally, this must have been one of the last performances for which the choir was prepared by their chorus master, Herbert Bardgett (ca 1895-1962), who had trained them for both of Sargent’s commercial recordings. It’s been very interesting to compare the 1954 and 1961 performances. The 1954 EMI sound has its advantages – for example, the harp is more audible – but, to be truthful, that recording is now starting to show its age. When I was making my comparisons the EMI recording sounded a bit fuzzy: Pristine offer greater clarity. In fact, I thought that Andrew Rose’s Pristine transfer of the 1961 broadcast held up pretty well in comparison with the studio-made version. At the start of each part of the work there’s a bit of audible hiss but I found that this was a very minor issue, forgotten in seconds. What is a bit more of an issue, I’m afraid, are the extraneous noises, mainly audience coughing, which “contribute” to the 1961 performance. I’m sorry to criticise fellow Yorkshire folk but the Huddersfield audience were a really undisciplined, bronchial lot and, inevitably, they always make their presence felt during the quietest passages, such as the Prelude to Part II and the solos that follow. However, I mention this in order to give a full picture: don’t let the prospect of Yorkshire throats being cleared deter you from investigating this performance. Richard Lewis was the leading Gerontius of his generation and, like the other soloists, his voice is clearly caught in this recording – as it was in 1954. Comparing the two recordings, I found, perhaps not surprisingly, that there were aspects of the 1954 performance that I preferred to his reading in 1961 and vice versa. So, for example, I prefer his way with the very first solo in 1961; in 1954 he seems to be trying too hard to make expressive points, whereas he’s more direct in 1961. In both performances we find him resolute in ‘Sanctus fortis’ but in the live performance there’s greater urgency in his singing – and that’s matched by Sargent’s conducting. That said, in the live performance he’s surprisingly cavalier with note values and with some of the rhythms. This trait carries over into Part II, where he treats several passages as if they were recitatives, varying the note values and rhythms from what’s in the score. In Part II, where I like a great deal of what he does, he gets into a bit of a tangle at one point and sings ‘It is a member of that wonderous family’ but he very quickly recovers his poise. Overall, though, his performance is perceptive and eloquent. Marjorie Thomas is a very fine angel. She may not be as individual as Janet Baker but she’s unfailingly musical, very expressive and the sound of her voice gives great pleasure. One detail I noticed is that at the words ‘That sight of the most fair’ she opts for the alternative vocal line an octave down. I don’t think I’ve heard any other singer do that but I’m sure it must have been an interpretative choice by Miss Thomas because there’s no doubt that she has the high notes in the part well and truly at her disposal and she made the same choice in the 1954 recording. I enjoyed every aspect of her singing and her performance culminates in an expressive and reassuring account of the Farewell. Incidentally, unlike Richard Lewis she is scrupulous in her observance of note values and rhythms. The third soloist, John Cameron is also excellent. He’s a noble Priest in Part I. In my survey I suggested that in the 1954 recording he possibly lacked a little bit of amplitude for the Angel of the Agony. I now think that judgement was unfair and certainly in 1961 his account of that important solo has all the necessary command and expressiveness. The contribution of the Huddersfield Choral Society is pretty good, though I think it’s fair to say that standards of choral singing nowadays are even higher than was the case in 1961. The semi chorus doesn’t always register as well as I’d like – they probably weren’t picked up clearly by the BBC microphones - but there’s much to admire in the choral contribution overall. The choir is impassioned at ‘Rescue him’ in Part I and they make a strong contribution after the Priest’s solo. In Part II they give it their all in the Demons’ Chorus while the opening of ‘Praise to the Holiest’ is terrific. Thereafter, that chorus sags a bit (from ‘God’s presence and his very self’ onwards) but I don’t blame the choir for that: Sargent fatally slackens the pulse in what I think was a misguided attempt to wring more expressiveness out of the music. I must admit that in the opening couple of minutes of the work I worried about the orchestra: the RLPO sound exposed and the playing is not sufficiently unanimous. Happily, things improve thereafter and the orchestral contribution is good, though under studio conditions it was possible to achieve more polish in 1954. Sargent conducts the work well. I referred to what I think is a miscalculation in ‘Praise to the Holiest’ but that’s an isolated instance. Otherwise he has the score at his fingertips and conducts with understanding. It’s noticeable that under concert conditions there are several places where he invests the music with even more urgency than he did in 1954. At the end of the work there’s applause and the BBC continuity announcer’s closing comments. 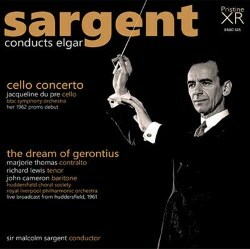 Sir Malcolm Sargent was a renowned exponent of The Dream of Gerontius in his day. I’m not sure that his EMI recording is currently available except as part of a large boxed set of his recordings. If that’s the case, then this Pristine set will be all the more welcome and, of course, it comes with a substantial added attraction in the form of Jacqueline Du Pré’s early account of the Cello Concerto. Andrew Rose has done an excellent job in transferring both performances and this set is well worth the attention of Elgar collectors.